Here it is. The final stop of my West Coast tour. Los Angeles and few other spots in SoCal. I arrived in Los Angeles on a very sunny, Friday afternoon. LA welcomed me with dead stop traffic on the 405, so naturally I pulled off to grab a bite to eat and a reprieve from the stop and go. I wanted something quick and customary which meant a burger and fries animal style from In and Out. After lunch, I headed towards the Griffith Observatory to kill some time before my friends got out of work. My good friend Tony (male Tony, often referred to as Ton-y) was picking me up from the airport after I returned my rental. Then I planned to spend the rest of the weekend with him and his girlfriend, Steph, in Manhattan Beach. Tony and Steph are some of my closest friends from Vermont and back in August they moved to California. I was so looking forward to a weekend with them getting to know their new neighborhood. It took me about an hour to go 12 miles, give or take. I was adamant about spending my afternoon at the observatory, so I didn’t care how long it took. Driving through Los Feliz, one of the surrounding neighborhoods south of Griffith Park, was a dream. I felt like I was on a movie set, each home more beautiful than the next. Perfectly manicured lawns, the greenest grass and tallest palm trees framed each street. I arrived at Griffith Park and switchbacked my way up to the Observatory. It was pretty busy, being that it was after lunch and such a beautiful day. I parked, paid the meter and headed up the hill towards the highly anticipated landmark. I’d argue the views at Griffith Observatory are the equivalent to the top of the Empire State Building or One World Trade in New York. You have unobstructed views of the entire valley of Los Angeles. The Hollywood sign sits in the midst as well and then of course the Pacific Ocean glistens in the distance. Smoke from the wildfires lingered over the valley and it was pretty wild to witness. Even among an enormous amount of tourists (me being one of them) I found such peace, walking around and observing families and couples. The architecture and science of the observatory might be the biggest attraction aside from the views. But I was so busy staring off into the distance, I barely explored a fraction of it. There were so many times on this trip that I essentially forced myself to leave whatever place I was at, because I knew I had to move on and keep heading towards my final destination, but I found it so difficult to leave. The observatory was surely one of those places, however I think it was the most special. Knowing I’d made it all the way to Los Angeles from Portland, on my own, was the most satisfying feeling. Add the beautiful sun slowly setting over the Pacific and the most perfect temperatures and it felt surreal. I don’t think I’ve experienced that kind of genuine happiness in such a long time. And I still had an entire weekend with my extended family ahead of me. After a week alone, I was more than ready to be in good company. You know in the summertime when it’s hot during the day with hardly any humidity and then the sun sets and all of a sudden it just gets cold? Not freezing and uncomfortably cold, but there’s a chill in the air and you suddenly need a light jacket? That’s what this day was like, in the best possible way. I took in one final breath of air, one last gander at the picturesque view and accepted it was time to meet Tony. The GPS took me the most ridiculous way back to the LAX that even if someone paid me to remember, I couldn’t. But I made it, said goodbye to my beloved Jeep that carried me all the way down the coast and started searching for Tony. He was already waiting for me on the other side of the parking lot and when I realized it was him, I lost it. I was so ecstatic to see a familiar face after being alone for over a week. I couldn’t wait to see Steph either, so we headed straight to their place. The rest of the weekend revolved around small adventures within their new neighborhood, picking out a Christmas tree and just spending quality time with two people that mean so much to me. Friday night we had an insanely good meal down by the pier and caught up on life. Saturday morning, Tony took me for a run around Manhattan Beach. The day continued with a few of Tony and Steph’s favorite spots, including a killer brunch place near the beach and eventually a small adventure in Palos Verdes. We hiked down the rocky cliffs to watch the waves and hopefully spot an otter or two. It reminded me of our adventures in Vermont. 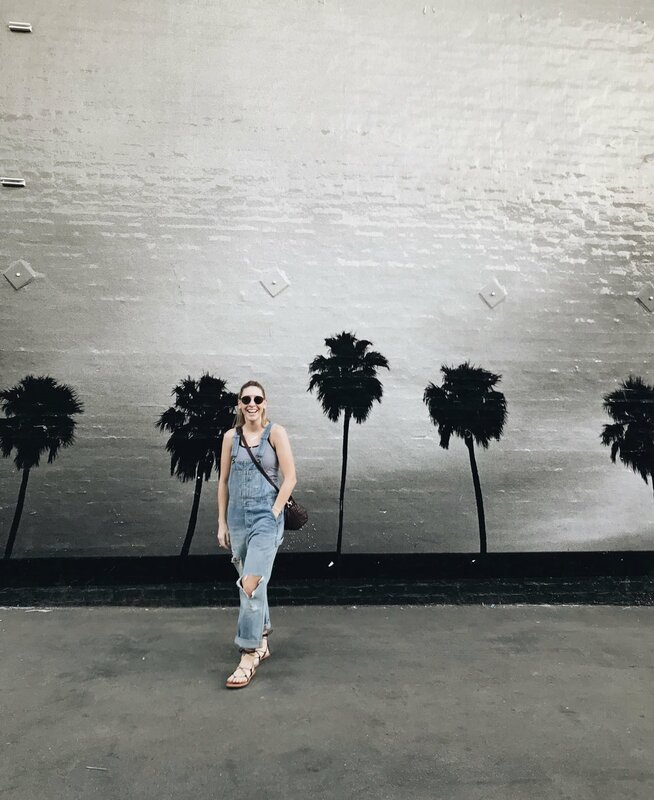 After we cleaned up post hike, we headed towards Abbot Kinney Boulevard in Venice in search of colorful wall murals and cool finds from all the local shops. We closed out Venice with a trip to General Admission where I spent way too much money (I mean, YOLO) and drank a Pacifico while I shopped. We had ice cream (twice) before dinner and were so beat from the day that we took it easy the rest of the night. But I mean, what a day, amirite? Steph and Tony needed to get a Christmas tree and run some errands so we shopped around for the perfect pine and took a family trip to Target on Sunday. It was a calm and lazy day and after a week of constant travel and navigation, it was so nice to just tag along. One thing I had been waiting for was a Pacific coast sunset. So far, they’d all been beautiful, but I knew the potential for a standout one still existed. So while setting up the tree and doing things at home, I noticed the color of the sky drastically change. Scared to miss out on the opportunity, Steph and I jumped in the car and took off towards the water. And I am so happy we did. It was the most vibrant sunset I’ve ever witnessed and sincerely left me speechless. Sunday night, there were fireworks on the pier. Their neighbor invited us over for a small BBQ before heading down to watch the show. I stood mesmerized by the colors and everything that was happening around me. I couldn’t have asked for a better end to this life altering trip. I also can’t thank Tony and Steph enough for having me and showing me just how sweet SoCal is. I’m incredibly grateful to have such sweet family coast to coast. I’ll be seeing you, California.